I emailed Chris Dalby of Current Cost a question about their devices a few weeks ago. Chris, not only answered my question but also offered to send me one of their energy monitors to try for myself! I love my Current Cost Envi 128. It is incredibly straightforward to setup – even I could do it, despite living in an apartment complex with no access to the electricity meter. I had mine up and running within minutes of receiving the delivery (I attached the clamp to the wire going into the fuseboard)! 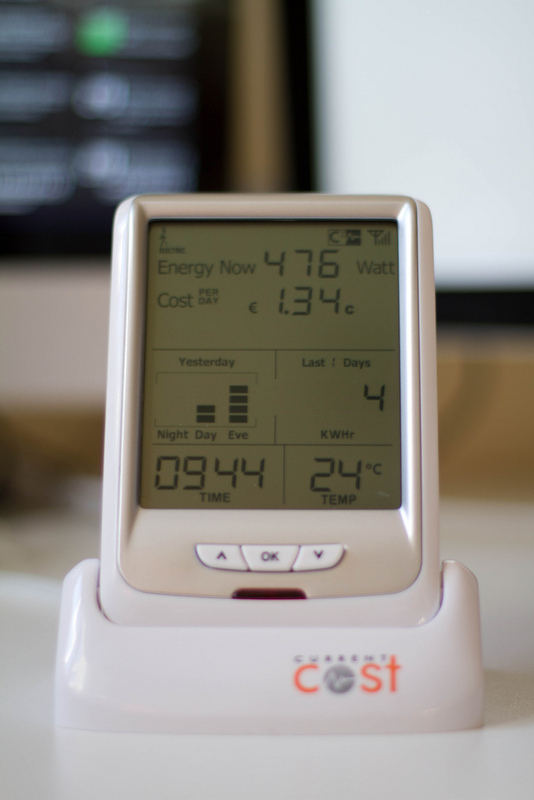 One of the really great things about the Current Cost energy meters is that they can be connected to a computer. This may not sound like a big deal but it means you can use software from the downloads page to chart your energy usage in real-time as well as for storing historical data. This allows for fascinating comparisons of energy use across different scenarios. Recently Current Cost announced they were partnering with Google to allow Google’s PowerMeter software to be used with Current Cost meters. The software for Google PowerMeter is available on the Current Cost site [after registration]. One disappointing aspect of the Powermeter software is that it is Windows only. Fortunately I have Windows installed (via Parallels) on my Mac so this wasn’t a major issue for me. The biggest issue I came across with the Current Cost Envi and PowerMeter software is, if you want an accurate picture of your energy use, you need to leave your computer turned on running the PowerMeter software all the time! Obviously this is not very energy-efficient!